Area Transportation Partnerships (ATPs) were created by MnDOT to emphasize greater public involvement, enhance regional planning and increase the development of the four-year State Transportation Improvement Program (STIP). 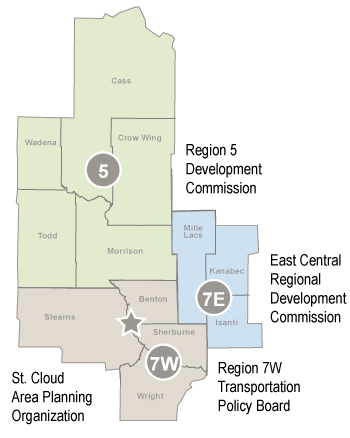 Central Minnesota Area Transportation Partnership is one of eight ATPs in Minnesota. Each year, we develop an Area Transportation Improvement Program (ATIP) that lists the state, regional and local transportation priorities for most of the area encompassed by MnDOT District 3. The regional priorities listed in the ATIP are then recommended for inclusion in Minnesota’s STIP.